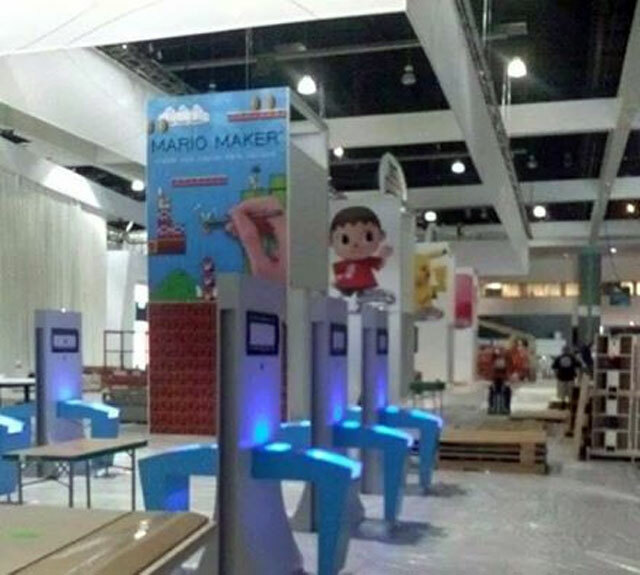 Nintendo Revealing Mario Maker at E3? A new title called, Mario Maker, may have been leaked a bit early. Thanks to a photo originally posted on Nintendo Enthusiast, we can see a game called Mario Maker on the showfloor next to The Villager, Pikachu, and Kirby as they appear in Super Smash Bros.
As with all rumors, take it with a grain of salt. This does look very legit however. This doesn’t seem like a picture that would be easy to photoshop. Judging by the photo, it looks like this game will allow players to create their own Super Mario levels based around the original NES sprites and world. We will keep you updated as more info about this leak surfaces. We won’t have to wait long, since E3 is in just a few days.